Although SmartFeud might look and feel like a simple game, you still might have some questions. Here we’ll give you the answers. 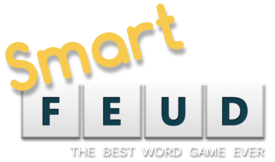 What is the difference between Scrabble and SmartFeud? The games may look the same at first glance, but there are some major differences. First: the board is bigger. It’s 16 * 16 in stead of 15 * 15. Of course, there’s more tiles in the game as well. But the most remarkable difference is the possibility to take one tile from the board, and use it to your own advantage. How does removing a letter work? It’s easy. You are allowed to take any letter from the board, as long as at the end of your turn all words formed are in the dictionary. Just pick a letter from the board, and place it on the special place that is reserved for this purpose. Yes. You can download SmartFeud completely free. Although you will see some advertisements. Of course we hope you regularly click on one of those ads, they are our lifeline! What if I buy the game? First, we at SmartFeud will be eternally grateful. Next, you’ll just keep your account from the free version, but now you can play without advertisements, and on top of that you can invite other players for a game in professional-mode. Buying the full version can be done trough the PlayStore or Appstore. How to invite other players? In the menu you’ll find the option to invite your Facebook, Instagram and Twitter friends to invite them for a game of SmartFeud. And you can send them an e-mail as well. Of course it’s up to you to find other ways to invite friends. Call you mom (she’ll like that! ), send an invite on Valentines Day, place an add in the local newspaper to find local friends to play with, everything is possible! When starting up for the first time you can create your own account. This account can also be used on multiple devices. Of course you can also login with your Facebook or Twitter account. I’d like to advertise, how? How does the multiplayer option work? You can play against one, two or three players. Just like the old-fashioned boardgame. Just select the players you want to invite for a multiplayer game, and wait until they accept your request. In a three- or four-player game it’s not possible to play with a random opponent. In professional mode you get only one chance to play a word. If it is not in the dictionary, you lose your turn. Be careful with weird words in professional mode! This option is only available in the paid version of SmartFeud. Why is this word (not) in the dictionary? We use standard dictionaries, and try to have them up to date as much as possible. Did you find a word that should not be in there, or should? Please send it to dictionary@smartfeud.com. We will review your suggestion. Can I play on my Blackberry? No, sorry. SmartFeud is only available on Apple and Android devices. Can I switch off push-notifications? Yes. You can find the settings in the menu. Why can’t I find any friends? It could be because you don’t have any, but if we rule out that possibility you are probably a front-runner. SmartFeud is a new game, it takes some time to build up a userbase. Just invite as much friends as possible, you’ll have plenty of opponents within no-time. Or try to play against a random player. Do I need to have Facebook? No. Although Facebook does make it easy to invite friends. And according to Mr. Zuckerberg you should, it’s up to you to value his opinion. In what languages is SmartFeud available? Currently SmartFeud is available in English and Dutch. We are working on different languages. If you are a native speaker and think you can help, please let us know! Well, we do not hire at this moment. We might if we grow, so please help us achieve that goal by promoting our game as much as possible, it’s in your own interest! Why does the starting player gets a free blank tile? Well, the starting player can not grab a tile from the board. So he can never score the bonus for an 8-letter word. That would be unfair, right? If you do not grab a letter from the board, but manage to form a word with all your 7 tiles, you get a 30-point bonus. If you grab a letter and use it to use all tiles, you even get a 50 points bonus. They get reactivated when a letter is removed from a bonus-square. This way the game is always exciting. Can I play with a random board? How to work with the filters? When inviting a player you can set some different filters to make the perfect match. Passing three times in a row makes you lose the game. So be careful at the end of the game, you might lose if you pass three times, and your opponent is able to form words each time. I love this game, what can I do to share this love? This is the most frequently asked question. First, you can rate us in the app-store or play-store. We’d appreciate that. A lot. And of course you can share the love of SmartFeud with your friends, invite them to play a game, and have fun. I lost my password or login, what to do? After crying, screaming and banging your head to the wall (please make sure the wall is solid, some walls can break easily!) just click on the retrieve password/login function in the menu, and we’ll fix it. Well, then send us an e-mail.